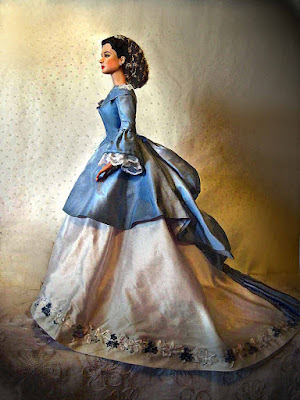 I had Alana Bennett do me another gown for the Tonner Scarlett. With all the costumes going around, I thought I might as well do something unique for the doll. The dress is a pale blue and white 2-piece day dress or so (I am not sure). 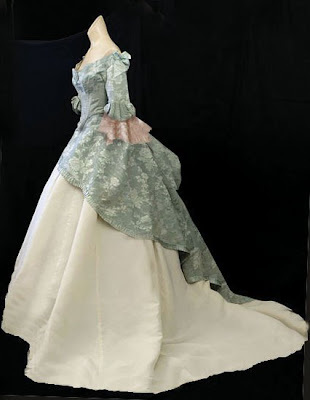 A friend sent me some pictures of Edwardian/Victorian gowns. I thought of combining designs to make the gown. I am not sure where she got the pictures. They must be from www. vintagetextile.com Anyhow, here are the pictures and the photo that Alana sent me of the gown -- which I couldn't stop turning into another portrait. 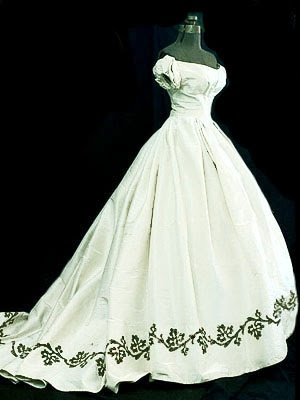 She did wonderful embroidery by hand on this gown. So what you see here are derivatives from original pieces. The blue and white ensemble has been revised via photoshop to have lace on its sleeves. I also added a bustle to it. Alana said the bustle was detachable if I so choose to have the dress without it. Can't wait to have it. In this life, we live for little joys. In Alana, I find more joy to fill up my little joys!